This twentieth century is the century when science and the economy have made incredible advances, so we need to make aspiration prayers that this material and technological advancement will be boons to world peace and world happiness. That is what this song is about. In this song, the third verse says "The vision of Your wisdom [is amazing]," so this refers to the Buddha. There is one verse for the Buddha, the next verse is for the Dharma, and the next one is for the Sangha. Those are the three outer sources of refuge. The verse that follows that, about the yidams and the dharma protectors, are what's called the three roots. Please rise up now from within my heart. Light up the whole universe! May Your auspiciousness light up the universe! May auspiciousness light up the universe! Is the true nature of mind, so luminous! Set the universe ablaze with auspicious excellence! "Other beings' happiness is as important as my own"
On December 29, 1997, in the Garden of Translation near the Great Stupa of Boudhanath, Nepal, this was spoken extemporaneously by the one only called "Khenpo," Tsultrim Gyamtso. Translated by Ari Goldfield. Also included in this section of the KTD Web site is a biography of Khenpo Tsultrim Gyamtso Rinpoche with links to some of his teachings. By the great, blazing blue weapon. Of samaya breakers and the ten objects. Protecting the commands of the incomparable son of Shuddhodana. In this degenerate age of conflict. This vajra name is everywhere. From the beginning to the end of this eon. Who blazes with love for all beings. And the yoke of his royal decree. The embodiment of all buddhas of the three times. Into the net of blazing, radiant activity. Adorns the finger of morality with the jewel of learning. This letter of explanation was written through the power of faith. May the eight worldly dharmas, the guru's enemies, be eradicated. Composed by the Third Bardor Tulku Rinpoche; translated by Lama Yeshe Gyamtso. Take refuge and engender bodhicitta. He wears a beautiful pandita's hat as a sign of the empowerments he has received. His two hands, holding bell and dorje, are crossed before his heart. Of the vajra body, speech, and mind of all Buddhas. Is the lama, the awareness of our own true nature. The recognition of this nature is my prostration to you. I make offerings without concepts of giving or receiving. And rejoice in the complete transcendence of mind. Please turn the wheel of inexpressible Dharma. I pray that you remain in your unchanging nature. Without reference point, I dedicate all accumulations of virtue. You embody the blessings of the body, speech, and mind of the Buddhas from all times and places. You are the master of an ocean of mandalas and the five kinds of wisdoms. You are the dance of illusion, wisdom emanation of Buddha Vairocana. I pray to you, glorious lama, supreme thought. And enters into mine, successively and then all at once. Becoming capable of actualizing the four kayas. OM AH HUNG Om Ah Hung. Oh learned one, you are the all-seeing guide of this world. Rinpoche, please give us your blessing. May I be able to let go of all expectations for this worldly life. May I use it meaningfully. May I be freed from the trap of the eight worldly values. And transcending the mind--this is Mahamudra. In this way please make me completely inseparable from you. Without acting and without adding anything else. Abandon taking and rejecting, grasping and clinging, all contrivance. The vast expanse of equanimity, this clarity and emptiness inseparable. For it is self-arising and self-liberating. How wondrous!" The lama joyfully dissolves into me. He is the luminous aspect of my own mind. Have never been separate, never involved in meeting and parting. This itself is seeing the very face of the ultimate lama. May attain unexcelled, genuine enlightenment. DE CHEN DOR JEY SEM DRUB TE. PEL DEN LA MAY SA THOB SHOK. May I attain the state of the glorious lama. Lama Thinley Gyamtso from the family of the great Dharma king requested this practice, and as a gesture of not rejecting it, the one who is called bodhisattva Jamgon Tulku, Peldan Khyentse Ozer, Ngakwang Chokyi Nyima, wrote this in a room above the main temple of Dowolung Tsurphu. May it serve a good purpose. The practice was transformed by the 3rd Jamgon Kongtrul, Karma Lodro Chokyi Senge, into one where his name in Sanskrit is included in the mantra, and so it is filled with blessing. This translation was made by Ringu Tulku and Michele Martin during May of 1992, in Sikkim. Also included in this section of the Web site is a life story written by the Ven. 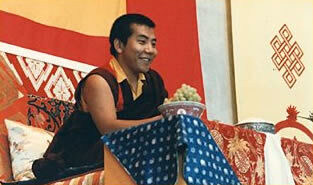 Bokar Tulku Rinpoche called "A Brief Biography of H.E. the 3rd Jamgon Kontrul Rinpoche," as well as a shorter biography of Rinpoche that includes links to his teachings on this site. Namo Guru Mati Dharma Singha Ye. Rests in meditation like a sun in the space of luminosity. To inspire the faith of myself and others. JAMGON KONGTRUL LODRO THAYE was one of the most brilliant stars in the galaxy of scholars and siddhas from Tibet, the land of snow. Predicted by the Buddha, he was the crown jewel in the rime (nonsectarian) movement of Buddhism in Tibet. He was born on December 14, 1813, to Sonamphel and Tashitso in front of Mount Pema Lhatse, one of the eight sacred places in Kham (Eastern Tibet). Lodro Thaye became learned in the ten ordinary and extraordinary branches of knowledge, and it became his responsibility to explain and compose texts, which incorporated a great number of teachings from both the old and new traditions, including the lineages of oral teachings, hidden treasures (terma), and teachings of pure vision. These were all brought together in Lodro Thaye's great living Treasuries of Knowledge. Like a second Buddha, he served all traditions of Dharma without any bias, through his teaching, practice, and activity. At the age of eighty-seven on January 19, 1899, he passed away. In the garden of Samdrub Choling at Dowolung Tsurphu, the unexcelled heart center of the dakinis, the second Kongtrul, Khyentse Ozer, was born in 1902 as the son of the Fifteenth Karmapa, Khakhyab Dorje, of whom he was the heart son as well. He studied, mastered, and practiced to perfection the treatises of the sutras and tantras in general, and in particular, the Five Treasuries, the path of skillful means, which includes the Six Yogas of Naropa, and the path of liberation, which focuses on the Mahamudra as it is elucidated in the special teachings of the Kamtsang Kagyu. Khyentse Ozer attained realization of the ultimate lineage and became the root guru of the Sixteenth Gyalwa Karmapa. Many times over, he gave teachings, empowerments, and reading transmissions from the old and new traditions, such as the Rinchen Ter Dzo, and he rebuilt the retreat center of Tsatra Rinchen Drak [his residence at Palpung Monastery], supplying it with everything needed. He passed away on the tenth of May, 1952, having accomplished great deeds for the benefit of the teachings and sentient beings. the incarnation of Lotsawa Vairocana. And especially to the lineage of Gampopa. According to this vajra prophesy, Jamgon Rinpoche was born on the first of October, 1954, the male wood horse year of the sixteenth cycle, in Lhasa, from whence the Dalai Lama guided the spiritual and temporal life of Tibet. His father was Tsering Tobgyal of Sadutsang, a family of wealth and high reputation, and his mother was Pema Yudron, the daughter of Sawang Ngawang Jigme Ngabo, a cabinet minister in the Tibetan government. Before and after his birth, many wonderful signs appeared to his mother, and he was recognized without any doubt as the reincarnation of Jamgon Kongtrul by His Holiness the Dalai Lama and the Gyalwa Karmapa through the vision of their stainless wisdom. Under their direction, Yonten Phuntsok, the Treasurer of the former Kongtrul Rinpoche, repeatedly requested the Sadutsang family to entrust the tulku to his Labrang (monastic organization). At last they consented, and when he was one year and five months old, Jamgon Rinpoche was formally recognized and offered robes and his title. At the age of six, he was enthroned by the Gyalwa Karmapa at the monastery in Rumtek, Sikkim. From then onwards, Jamgon Rinpoche as a heart son was inseparable from His Holiness, who supervised his education right from the very beginning, starting with reading, writing, and memorizing texts. At the age of thirteen, he received from His Holiness the Sixteenth Karmapa getsul ordination along with Shamar Rinpoche and Tai Situ Rinpoche on the fifteenth of Saga Dawa (the fourth Tibetan month) of the male fire horse year at Rumtek's Shedrub Chokhor Ling (Dharma Chakra Centre). At that time, he received the name Jamgon Lodro Chokyi Senge, Tenpay Gocha Ngedon Gyurme Trinle Kunkhyab Pelzangpo. Jamgon Rinpoche then studied a great number of texts, both in general and specifically, with Thrangu Rinpoche, a great scholar and holder of the Vinaya. His further studies also included all the tantras of Marpa's tradition, especially those of the Karma Kamtsang, and the lama dances, preparation of mandalas, chanting and musical instruments pertaining to the practices of Guru Rinpoche, Vajrakilaya, and others. Jamgon Rinpoche received from Khyabje Kalu Rinpoche, master siddha and the activity emanation of Jamgon Lodro Thaye, teachings ranging from the Mahamudra Preliminary Practices of the Kamtsang tradition, up to empowerments, reading transmissions, and explanations for Gyalwa Gyamtso, Demchok, Dorje Pagmo, and especially, the Six Yogas of Naropa, Mahamudra, the Five Golden Teachings of the Shangpa Kagyu, the great empowerments of Kalachakra and Rinchen Terdzo, and at different times, countless other teachings of the old and new traditions. At the age of twenty, on the fifteenth day of the first month (the month of miracles) in the female water ox year, he received full gelong ordination at the Dharma Chakra Centre from His Holiness the Sixteenth Gyalwa Karmapa, who acted as the khenpo or abbot for the occasion, since he is master of the qualities of discipline and learning, well-versed in the pitakas, the second Shakyamuni of this degenerate time, and leader of all those who hold ordination. Jamgon Rinpoche took gelong vows along with Chamgon Situ Rinpoche and Khyabje Gyaltsab Rinpoche and was assisted by a master of procedure and other monks to complete the necessary number. Believing them to be the very foundation of the Dharma, Jamgon Rinpoche always guarded carefully these precious Vinaya rules, protecting them as if they were his own eyes. He gave the ordinations of getsul and gelong to about three thousand monks in India, Nepal, Tibet, both the worlds of the East and West, and so became a great holder of the Vinaya. From His Holiness the Gyalwa Karmapa, Jamgon Rinpoche received the Bodhisattva Vows, which are the foundation of the Mahayana path, from both traditions [of Nagarjuna and Asanga]. He continually practiced the many aspects of a bodhisattva's path--the six paramitas, the four ways of gathering disciples, and so forth--training in the extensive activity of the bodhisattva, and becoming a great one himself. Jamgon Rinpoche had great faith, respect, and devotion for his spiritual teachers, the source of all paths and practice, and received from them many teachings of the sutra and tantra traditions. Especially, his relation to the Gyalwa Karmapa, embodiment of all refuges, was one of total devotion, respect, and pure vision, greater than that even for the Buddha himself. Rinpoche served His Holiness perfectly and received from him all the profound oral instructions, such as the Five Great Treasuries, all the empowerments, reading transmissions, and explanations of the Kamtsang Kagyu, the Root Text of Mahamudra, and so forth. In particular, the realization of Mahamudra, which is the heart blessing of the ultimate lineage, was transferred to him and he became a great siddha. In 1974, Jamgon Rinpoche accompanied His Holiness the Gyalwa Karmapa on a tour of numerous places in America, Europe, and Southeast Asia. 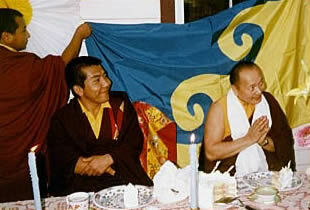 After His Holiness' paranirvana, Jamgon Rinpoche continued to travel to Europe and Asia, and established the Rigpe Dorje Foundation [in the United States, Canada, and France] and the Paramita Charitable Trust [in India, to further his activities of social welfare for the benefit of others]. Through empowerments, explanations, and advice, he generously gave teachings for three different types of students in accordance with their needs and so became like the medicine that restored the teachings and healed sentient beings. In 1982, in order to counteract obstacles to the swift return of His Holiness the Karmapa, Jamgon Rinpoche built a Sidok Stupa with the proper measurements, mantras, dharanis, and consecration. For the same reason, he began the practice of l00 million recitations of the Vajrasattva mantra every year on the occasion of Saga Dawa (the fifteenth day of the fourth Tibetan month). In 1984, following the wishes of His Holiness, he started the construction of a new building for Karma Shri Nalanda Institute and it was inaugurated in June of 1987. Not only did Jamgon Rinpoche provide for all the furnishings of the entire building, including the statues and so forth for the shrine hall, but he also found the means to support about 150 students, comprised of many tulkus, lamas, and monks. Jamgon Rinpoche visited Tibet in 1984, and at Palpung Monastery, he gave empowerments and teachings to a vast gathering of monks and lay people, and ordained about 500 monks with getsul and gelong vows. He then visited Lhasa and Tsurphu Monastery [the Seat of His Holiness the Gyalwa Karmapa] where he gave empowerments and teachings to monks and lay people, and the ordinations of getsul and gelong to about one hundred. Furthermore, he was able to obtain permission for the reconstruction of Tsurphu, towards which he donated all the offerings that were made to him. In 1988, Rinpoche constructed a new monastery at Lava in Kalimpong [West Bengal], and presently about 108 monks reside there, ten of whom are involved in a three-year retreat following the tradition of the golden Dharma in the Shangpa Kagyu. Likewise, in 1988 he started the construction of Phullahari Retreat Center in Nepal, where there are now about fifteen monks practicing. In 1990, he gave the great Kalachakra empowerment to the monks and lay people of Rumtek and donated funds to start a yearly Kalachakra practice session. In 1991, Jamgon Rinpoche returned to Tibet and visited Derge Gonchen where he gave an empowerment, reconsecrated the old and new Derge Printing House, and made donations to them. Thereafter, he journeyed to Palpung Monastery and gave the great Kalachakra initiation to about 550 lamas and tulkus of the area, including Sangye Tendzin of Japa Gonzhab Surmang Tentrul, Dodrak Tulku, and many others. He also gave getsul and gelong ordinations to about 550 people. Next he travelled to Damkar Monastery in Nangchen where he again gave the Kalachakra empowerment to about 1,000 Sangha members, including lamas and tulkus, such as Shangu Tulku, Kyodrak Tendzin, Salga, Drukpa Tulku, Demon Tulku, and many others. In 1992, he gave the Kagyu Ngakdzo empowerments to the monks, nuns, and lay people of Rumtek, and inaugurated the Jamyang Khang, a primary school, which he had sponsored, designed, and constructed. As his last activity, Jamgon Rinpoche offered mantras and dharanis to fill the new statue of the Buddha in the main shrine hall of Rumtek Monastery and gilded the whole statue to create an auspicious connection for sustaining pure samaya. Once he had consecrated the statue, Jamgon Rinpoche told his attendants, "Now I have fulfilled all the wishes of His Holiness." In brief, to Jamgon Kongtrul Rinpoche one can say: "I pray to you, source of all qualities, the one rich in faith, discipline, learning, generosity, intelligence, modesty, and humility." From childhood, he naturally had all the qualities of a noble being. His faith and pure vision of his teachers was unparalleled, and especially, his devotion to his root guru, Vajradhara Gyalwa Karmapa, was fully equal to that of all the previous lineage holders of the Kagyu tradition. He never tired nor was careless for a moment in attending to the physical needs or following the commands and wishes of his lama. With great respect he served His Holiness even to the point of cleaning his bathroom and sweeping the floors with his own hands. His life is a great teaching to people like us who treat the Dharma and the lamas like water by the roadside, which we take when we need it, but do not respect or give devotion from our heart. Jamgon Rinpoche studied numerous sutras, tantras, their commentaries and oral instruction, from specific and general traditions. As a sign of having genuinely realized these teachings, he displayed the qualities of faith, pure vision, loving-kindness, and genuine concern for the well-being of others that were so much a part of him that they became inseparable from his name. He constantly fulfilled the wishes of others through giving away all that was offered to build monasteries, establish centers of learning and practice, to create representations of the Buddha's body, speech and mind, and to support the Sangha and the poor and needy. With clear wisdom of the world and Dharma, he soothed the mental sufferings of others, cut through the net of their doubts, and guided them onto the right path through direct and indirect means. To his attendants and all those, high or low, with whom he related, Jamgon Rinpoche always showed the qualities of constant friendship, modesty, humility, and gratitude; he had perfected all these qualities that are esteemed in this world. We, his disciples, should always remember this perfect life story of our supreme guide and seek to emulate it with faith, respect, and pure vision. At the age of thirty-eight, Jamgon Rinpoche suddenly passed away, due to the obstructions for Buddhism and people in general, and in particular, for the Kagyu tradition. Considering his age, learning, qualities, aspirations, and activities, his passing has been an unbearably sorrowful event for all his disciples and those who knew him. Yet, as ordinary people with limited understanding and realization of how things truly are, we are unable to know the profound methods for benefiting sentient beings in the right time and place. Therefore, we should always look at his life with pure vision, great faith and devotion, and try to attain in our lifetime the supreme achievement of Mahamudra through receiving in our mindstream the blessing of his body, speech, and mind. We should always turn our minds towards praying that his perfect incarnation will swiftly return, and that his life and activities will be brought to perfection following the aspirations he has made for the Dharma and sentient beings. 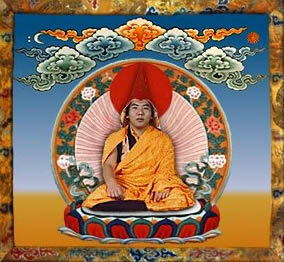 From now until enlightenment, supreme Lama, May we always serve and rely on you. May we persevere in practice and complete the path, Giving up what is negative and perfecting the positive. Following the request of Jamgon Kongtrul Rinpoche's attendants, Tenzin Dorje and Sonam Chophel, this was written by Bokar Tulku, Karma Ngedon Chokyi Lodro, whose devotion is inspired by this life of Jamgon Lama, at Rumtek Retreat Center, Yiwang Samten Chokhor Ling, on the 5th of May, 1992. Sarva Mangalam. This was translated by Ringu Tulku and Michele Martin during May, 1992 in Sikkim. Also included in this section of the Web site is a translation of the Guru Yoga for the III Jamgon Kongtrul Rinpoche, called "Billowing Clouds of Blessing," as well as a shorter biography of Rinpoche that includes links to his teachings on this site. WHEN BUDDHA SHAKYAMUNI turned the wheel of Dharma in the Jampudvipa world, this being, known to us as Traleg Rinpoche, was born as Ananda. Perfecting Buddhahood, he worked to develop the Buddha Dharma. He next incarnated as Tulku Tsermed Oden, inseparable with glorious Sangwai Dagpo, Lord of Tantrayana, and taught tantrayana in the unsurpassable dakini realm. Having developed such teachings in all directions through endless times, his next rebirth was as the mahayogi Thogmed Yonten, skilled in all miraculous powers. This mahayogi was the disciple of yogi Sahara and Lord Nagarjuna. He benefited beings by developing Buddhism in general, and the tantrayana in particular, in all the ten directions of the world. His next rebirth was as mahasiddha Dapa Sherab, principal disciple of mahasiddha Tilopa. Having firmly stabilized the very transmission and teaching of mahasiddha Tilopa, his next rebirth was as siddha Dogon Lotsawa, disciple of glorious Naropa. 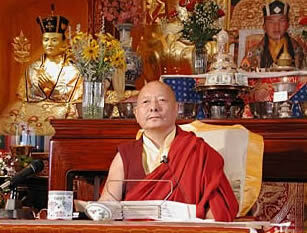 He translated many unavailable teachings of the lesser and higher vehicles, particularly the Vajrayana teachings. His next incarnation was as a disciple of Marpa Lotsawa named Ngod Choku Dorje, who translated tantric teachings from Sanskrit into the Tibetan language. He was skilled in both learning and meditation, and carried out the sedgyerd (learning) transmission. His next incarnation was as a disciple of the great yogi, Jetsun Milarepa, named Rechung Dorje Drakpa. He developed the teachings and became famous all over Tibet. His next incarnation was as a disciple of Je Gampopa, Saltong Shogom, one of the "Three Men from Kham." Likewise, his next incarnation, Pandita Wangchuk Dorje, was famous and skilled in both sutrayana and tantrayana. 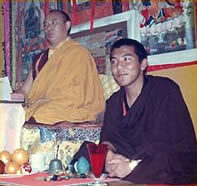 His next rebirth was during the time of the Third Karmapa, Ranjung Dorje, as Toden Tachug. He developed and taught Kagyu teachings. Later, for many generations, he incarnated as a bhiksu (a fully ordained monk) called Chokyi Wangchuk, who enriched and liberated limitless living beings. Then Chokyu Dragpa incarnated in the second seat of the Kagyu order in Karmai Gon where he taught and developed the Buddha Dharma. "You will benefit living beings while bearing the name Nyima for eight incarnations as a fully ordained bhiksu." The present ninth Traleg Kyabgon Rinpoche was born in the wood sheep year (1955), in the first month of the Tibetan calendar. Enthroned at the age of 1-1/2, he was fully able to participate in the playing of damaru and bells and to give the traditional blessings during the enthronement ceremony. When he was four, the Communists invaded Tibet and about 100 people from his area escaped. During the critical moments when the people had no idea where to go, the four-year-old Traleg Rinpoche directed them and eventually they all escaped safely to India. 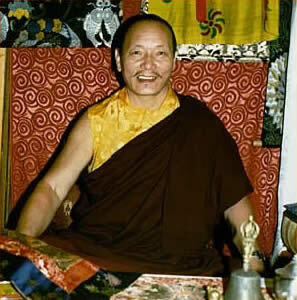 In 1989, Traleg Rinpoche taught extensively at Karma Triyana Dharmachakra and visited the North American affiliates of His Holiness the Gyalwa Karmapa. At that time, the Ven. Khenpo Karthar Rinpoche dictated this introduction to Traleg Rinpoche that was presented to the centers on his arrival. Also included in this section of the Web site is a shorter biography of Rinpoche with a link to his teaching on this site.